Poppies at Play: Round Table.. I just have to give a big sigh of relief right now. Phhhheeewww! The project of the day is a round table that Mom-in-law gave to me. They have had it for a really long time so I wanted to do something really cool with it. When she gave it to us a couple of the legs were broken or getting there. By the time we got home with it ALL of the legs were broken. Joe glued them for me and we had the table sitting in my front room. I even liked it unpainted just because it has such a cool shape to it. I put it on my "To Do" list for today. I had an image in my mind of what I wanted it to look like, and to be honest, I really didn't think it was going to turn out the way that I had hoped it would. I painted the base and the lip of the table black. I really wanted triangles so the top would look like pizza slices. I found a long enough straight object that I could trace my lines and then I taped each triangle and painted it. Of course looking back it would have been much easier to just paint it all light green and then only have to tape around 4 triangles. Live and learn right?? Here is the end result! OH MY GOSH, ANDY...YOU ARE AMAZING! I love it! I can't believe how adorable it turned out! Way to go! So cute you crafty girl! I would have never thought that table could be salvaged--it's been through a lot! It looks amazing. Oh, fantastic. I love the round table---the black and green are wonderful. Oh wow - - - that was quite a table face lift!!! 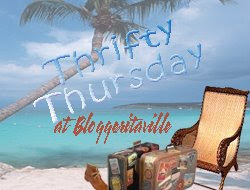 I stopped by from Leigh's Thrifty Thursday. Wowzers! That makeover is stunning! I just love the look of the table now. Great job. Can I ask what type paint you used? I just picked up a sewing machine table that needs some paint 'love'. I've sprayed frames and such but never tried my hand on furniture. Thanks for sharing your great piece! How cool is that table now!?! You did an amazing job!